Attack on Titan 2 delves deeply into the fascinating narrative of Attack on Titan's second season and offers players versatile action and new challenges, as it introduces the newly improved omni-directional mobility gear offering advanced freedom of movement and targeting precision to counter enhanced Titan movements. 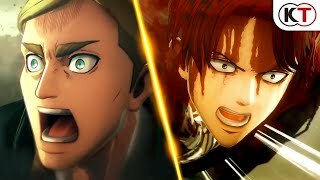 3/14/2019: Attack on Titan 2: Final Battle will be available on July 5th. 9/25/2017: Attack on Titan 2 will be available on PC, PS4, Switch, and Xbox One.